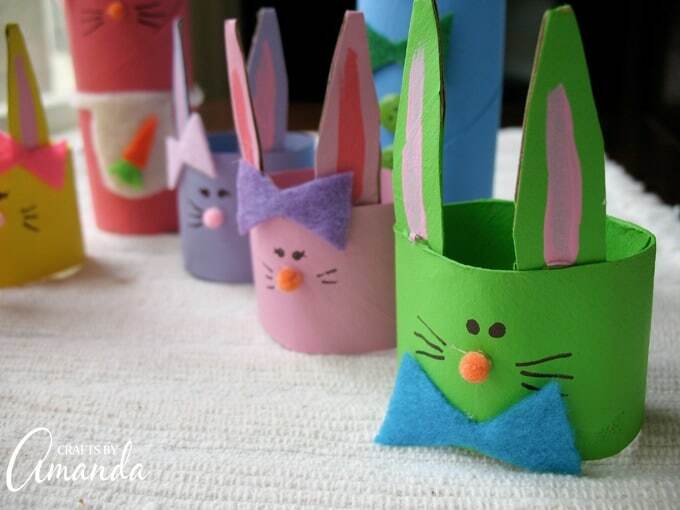 Cardboard Tube Bunny Rabbit Family: an cute Easter craft kids will love! Ahh bunnies! They’re so cute, and cuddly, and colorful… ? Well, this cardboard tube bunny rabbit family is anyway! These bunnies don’t have to be an exclusive Easter craft but their pretty colors remind me of jelly beans! 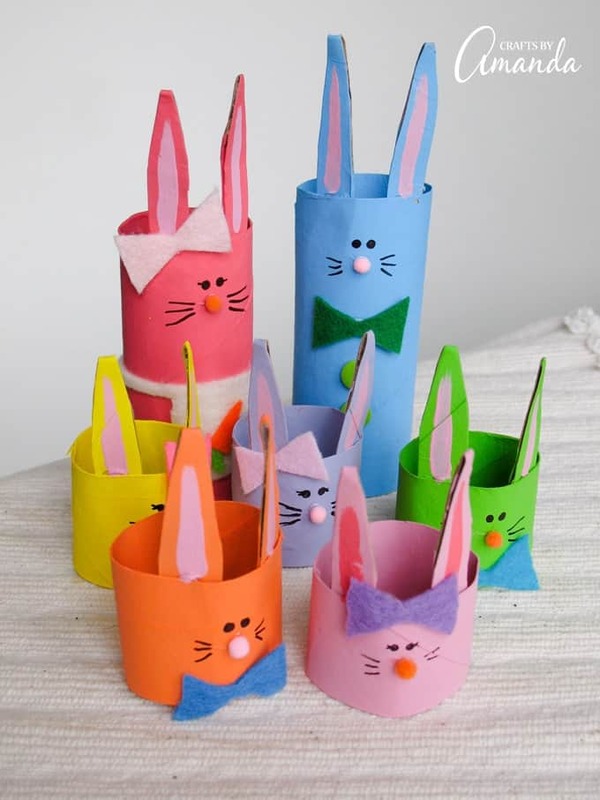 Using cardboard tubes from paper towels or bathroom tissue, you can make this fun and bright family of bunny rabbits with your kids! A fun and easy recycled kid’s craft! Some people are uncomfortable using bathroom tissue rolls, especially those in a day care setting. Paper towel cardboard tubes are the same diameter, just longer, and work equally well. You can simplify your cardboard tube bunny rabbit family depending on the age group of your children. To simplify some of these steps, skip the apron on mama bunny and the buttons on daddy, and you can also use pink felt triangles (or construction paper) for the noses. Wiggle eyes will work too instead of a marker. I do use a hot glue gun in this project, so please supervise children closely or use a quick drying glue such as Beacon’s instant This cardboard tube bunny rabbit family is such a cute way to reuse cardboard tubes. 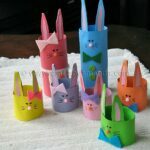 I have a lot more cardboard tube crafts for kids and also animal crafts for kids that are fun to craft up with your kiddos as well! Cut the cardboard tubes as follows. You will end up with 5 baby bodies, 2 adult bodies and 14 ears. Paper towel tube – Cut a 4.5″ piece for dad, a 4″ piece for mom and five 1/2″ ears. Toilet tube #1 – Cut two 1.5″ bodies and two 1/2″ ears. Toilet tube #2 – Cut two 1.5″ bodies and two 1/2″ ears. Toilet tube #3 – Cut one 1.5″ body and five 1/2″ ears. Paint each tube, inside and out, and a set of ears to go with each body. Run a line of hot glue inside the ear and squeeze it closed to flatten it. Use scissors to trim tops of ears to make them pointy. Hot glue the ears to the top inside of the cardboard tube body. Use pink paint to paint a line on each ear. Glue on mini pom-pom noses and cut bows from felt and attach. For girls, attach bows up by the ears and for boys at the bottom front of the body. Use Sharpie to add eyes and whiskers. If you like, cut a simple apron from white felt for the mom. Cut out a small carrot from orange and green felt and glue to the apron. Glue apron in place. Glue 2 buttons to the front of the dad. 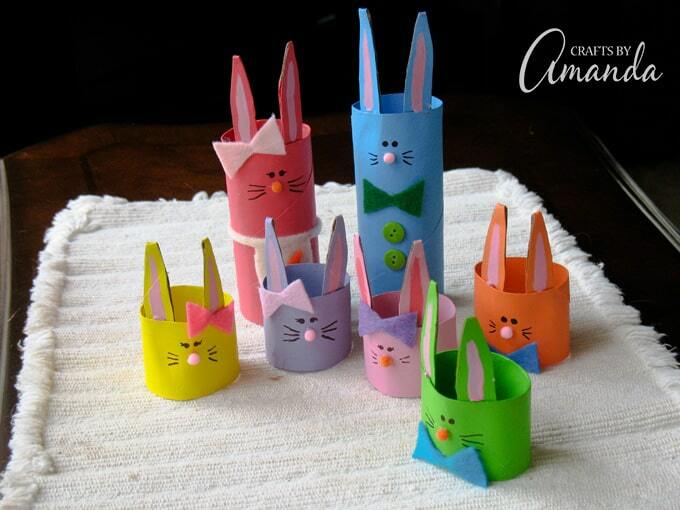 I hope you enjoy making your adorable cardboard tube bunny rabbit family! 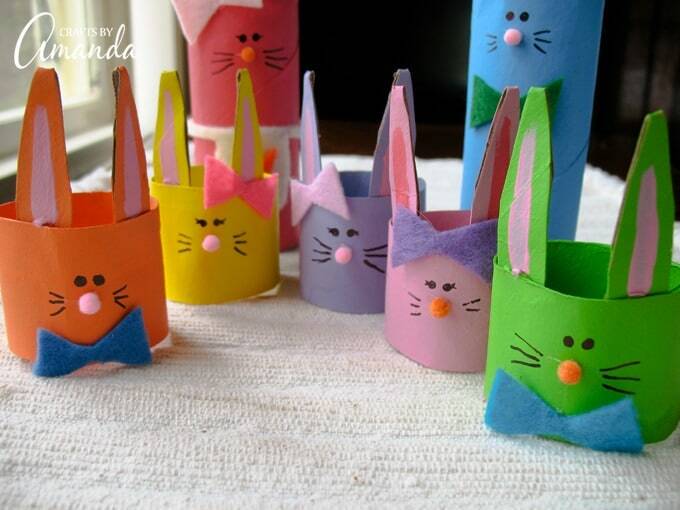 It makes an awesome Easter craft that the kids will love to help with. Check out more awesome Easter craft inspiration like these cute and super easy Pom Pom Chicks or these Easter Chick Placeholder Cups! This post was originally published on this blog on March 10, 2011.